Vortex tubes produce up to 6000 BTU/hr of refrigeration and temperatures as low as -40 deg to solve a variety of industrial spot cooling and process cooling needs. 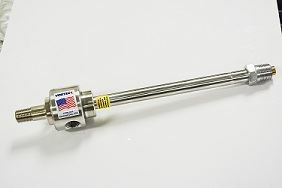 With no moving parts, a vortex tube is highly reliable and inexpensive; and requires no electrical connection at the cooling site. Vortex tubes cool instantly, relying on compressed air spinning in the tube to separate the air into cold and hot air streams.